Chromatius' father died when the boy was an infant, and he was raised by his mother and large family of older siblings. Ordained c.387. Attended the Synod of Aquileia, and worked for the strong denunciation of Arianism that resulted from the synod. 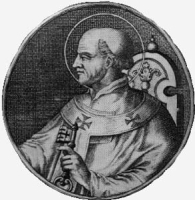 Bishop of Aquileia in 388. He worked for peace with invading troops led by Alaric, and provided aid to those who suffered by being in his path. Active correspondent with Saint Ambrose of Milan. Friend of Saint Jerome, who dedicated several works to him. Influential in the translation of early Christian works into Latin for wider use. Financed Saint Jerome's translation of the Bible, and Rufinus' translation of Eusebius' Ecclesiastical History. Wrote several respected scripture commentaries, seventeen of which survive. Friend of Saint John Chrysostom, supporting him and writing on his behalf against the unjust accusations of Emperor Arcadius. Nothing is known of John's father, but history remembers his mother as a very pious woman who eventually entered a convent. At age eleven John moved in with and was educated by his uncle, Father John Hinckaert at Saint Gudule's, Brussels, Belgium. Ordained in 1317. Served as chaplain at Saint Gudule's for 26 years. In response to pamphlets teaching heresy, John began to write his own, primarily on false mysticism being taught. None of these writings have survived. In 1343, John and his uncle retired to a hermitage in Groenendael. His reputation for wisdom and holiness began to spread, and the hermitage attracted like-minded men. The group founded a formal community of Augustinian canons regular on 13 March 1349 with John as prior. Many people came for spiritual guidance by the canons, and especially from John. He led a life of extreme austerity, became famous as a sublime contemplative and skilled director of souls. As the Spirit moved him, he resumed writing. Noted as the greatest of the Flemish mystical writers. A pious youth, his family nicknamed him "the little monk." After graduating the Jesuit college in Poznan, Poland, Melchior joined the cavalry, and was made an officer within three years. In 1715, against the advice of his brothers in arms, Melchior joined the Conventual Friars Minor in Kraków, Poland, took the name Rafal, and was ordained in 1717. Assigned to parishes in nine cities, he was eventually sent to Lagiewniki in central Poland, where he spent most of the last 13 years of his life. He distributed food, supplies and clothing to the poor, and played the harp, lute and mandolin to accompany liturgical hymns. Spent 20 months in Warsaw ministering to flood and epidemic victims. Known for simple and candid sermons, generosity, and as a great confessor. All classes were drawn to the self-sacrificing way he lived out his religious profession and priestly ministry. Raised in a pious family. Poor Clare Capuchin nun at Barcelona, Spain, entering the Order on 16 September 1603 and making her religious profession on 8 September 1609. Novice mistress and director of formation. Founded a monastery in Zaragoza, Spain on 9 May 1614. Abbess in 1627. 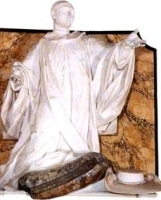 Founded a monastery in Murcia, Spain on 2 June 1645 where she served abbess until 1661. She spent her spare time studying the sacred texts and the great Church writers, she came to a profound understanding of the Breviary, the schedule of prayers and hymns recited each day. Mystic and visionary who could see and communicate with her guardian angel. 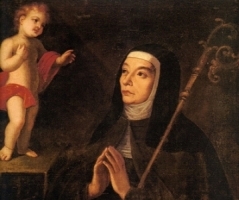 Her parents, Saint Flavian of Acquapendente and Dafrosa of Acquapendente, were martyred in the persecutions of Julian the Apostate, and Vivian and her sister Demetria were turned over to a woman named Rufina who tried to force them into prostitution. Upon her continued refusal to co-operate, Vivian was imprisoned in a mad house, then flogged to death. A church was built over her grave, in the garden of which grew an herb that cured headache and epilepsy. This and her time spent with the mentally ill led to her areas of patronage. Greek Catholic. Ordained in 1923. Co-adjutor bishop in April 1945. Arrested for his faith on 2 June 1945, and sentenced to ten years in the forced labour camps in Vorkuta, Russia; transferred in 1950 to Mordovia, Russia. Released on 15 November 1954, and returned to Ivano-Frankivsk, Ukraine. Arrested again for his faith in 1962; sentenced to five years in the forced labour camps. Released on 30 November 1968. Routinely and repeatedly interrogated by the KGB until his death. Son of Pope Hormisdas, who had entered religious life after raising a family. Sub-deacon when elected pope at the insistence of King Theodaha the Ostrogoth. A humble man caught in the middle of a political ploy by Vigilius and the Empress Theodora to seize the pontificate for the Monophysites. Kidnapped, convicted of a trumped-up charge of treason, and exiled to the island of Ponza, Italy. Born to the nobility, son of the count of Marsi. Educated at Monte Cassino monastery. Poet. Benedictine monk at Monte Cassino under the direction of Diseiderius II who would become Pope Blessed Victor III. Deacon of Saint Agatha's church. Priest. Cardinal in 1059, elevated by Pope Nicholas II. Abbot at Monte Cassino in 1087. Patron of impoverished scholars of his day, hugely expanded the abbey library and promoted the work of its copyists. Mediator between Crusaders and the Greek emperor Alexicus. An ancient statue of the Madonna and Child. It was brought from Egypt to France during the Crusades by three Knights of Malta who had been briefly captured by Saracens. It was enshrined at Liesse, diocese of Soissons. The original statue was destroyed during the French Revolution. A duplicate was installed and crowned in 1857. Hermit in the caves around Kiev, Ukraine. He was found dead, and his brother monks and hermits prepared to bury him; he suddenly sat back up, returned from the dead. He would not tell the brothers what he had seen, just told them to stay true to their Rule and obey their abbot. Known as a healer and miracle worker. Member of the Brothers of the Christian Schools. Martyred in the Spanish Civil War. Deacon. Monk at the monastery of Tabenna in upper Egypt. Bishop of Edessa, Mesopotamia. Attended the Council of Chalcedon in 451. It was through his prayers that Saint Pelagia the Penitent was converted to Christianity. Bishop of Rouen, France in the early 4th-century. Signed and supported the decrees of the First Council of Arles in 314. Benedictine Cistercian monk of La Criste in Champagne, France. Abbot at the Matallana monastery in Valladolid, Spain. Seventh century BC Old Testament prophet in Judea during the time of the captivity. Dominican lay-brother at Baeza, Spain. Noted for having only two interests in life: study and prayer. Directed by his spiritual directors to take holy orders. Monk at Constantinople. Bishop of Troas, Phrygia. Prohibited his priests from working in secular courts. Martyred with four unnamed in the persecutions of Emperor Valerian. Early, possibly first, bishop of Brescia, Italy. Several Greek Christians martyred in the persecutions of Valerian - Adria, Aurelia, Eusebius, Hippolytus, Marcellus, Mary Martana, Maximus, Neon and Paulina. Four Christians martyred in Africa in the persecutions of Arian Vandals - Januarius, Securus, Severus and Victorinus.